Draping is an extremely versatile decor option for many types of events. It can be used to divide a space, hide unsightly objects or provide a beautiful backdrop behind a stage or head table. The team at Janet's can also offer many more creative draping installations and displays including ceiling drape, architectural accents and much more. Drape by the foot is one of the simplest installations. Height can range from 8 ft to 16 ft for our basic per foot black and white drape. All we need is the measurements for the horizontal length that you need. If you are doing a whole room give us the dimensions and we will help make sure it is covered top to bottom. 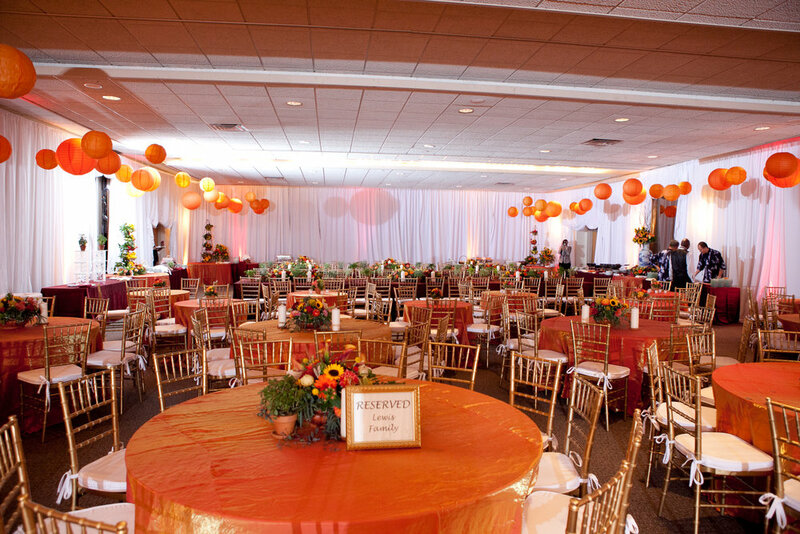 Janet's is one of the only decor providers in the area that will do more intricate draping installations. With thousands of installs done over the years there isn't anyone with more expertise and experience. Weddings and special events can be accented with dramatic ceiling or architectural drape at just about any location. We also specialize in tent decor and incorporating chandeliers as well as other lighting elements into our designs. Photos help - Please email along some photos of your location. This will be helpful when making an estimate. Access times - Keep in mind set up and removal time. Provide all this info to one of our coordinators or they will walk you though what is needed. Can you turn on and off sconce lights - You should make sure the lighting at your location will be able to adapt and dim independently. There is nothing more unsightly than a sconce left on behind beautiful draping. Colors - We have many great colors to help set the theme for your event. Based on what is needed for your installation a coordinator will be able to provide a list of available colors. If drape by the foot is desired. Please include address or city and state as needed. Please describe what you hope to have draped or installed. Thank you! A decor coordinator will review your request and get back to you. Feel free to call or email with any other questions.